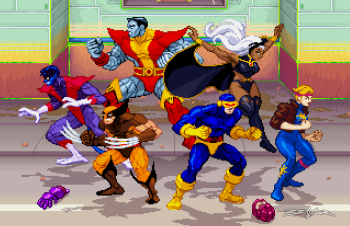 The poses and background are based on the Konami arcade game, which was based on "Pryde of the X-Men," the 1989 pilot episode that didn't get to become a full series. The sprites were posted separately on the ScrollBoss site, but (thankfully) weren't made so far apart that my style changed much between them. I was originally going to use Storm's standing sprite, but the layout didn't work. The 17 x 11 inch print is available from the Prints page!